How to show Indian Currency Format in Excel? How to show Indian Number Formats in Excel? This is a guest post by our excel ninja – Hui. Today we will learn how to format numbers and amounts in Indian currency format. Indian numbers are grouped differently than standard English numbers. 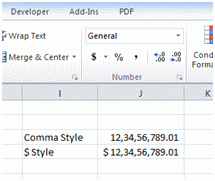 Now in Excel the Default “,” and “$” Style will show the way you wanted. More Quick tips & Number Format tricks. Can you explain the historical/cultural reason for that grouping ? I don't have additional setting option in region and language button. Is this facility available only in vista and window 7? the facility is available only with Windows Vista / Windows 7 and above. Interesting, but could you explain what the backslashes are for? I've never used a backslash in a custom format. @Leonel .. the backslash forces excel to treat , as a comma instead of thousand's separator. @Cyril.. not sure why, but I think we are used to counting in hundreds and we have established notations for hundred thousand - lakh and hundred lakhs - crore. May be they would have just adopted the convention of separating hundreds when they started writing numbers in script (and eventually on to computers). @Dominik.. good links, thanks for sharing. @JPC what version of windows are you on?
" @@\\,@@\\,@@\\,@@\\,@@\\,@@\\,@@0"), " \,", "")) & ".00"
For those who have not worked with event code before, you would install this code by right-clicking the name tab at the bottom of the worksheet you want to have this functionality, click "View Code" on the popup menu that appears and then copy/paste the above code into the code window that appeared. That's it! Now go back to the worksheet and type in a number with up to 15 significant digits into Column C (if you left my code alone) or into whatever range you changed my example "C:C" cell range to in the assignment to variable R.
You can also download the new font from http://blog.foradian.com/ (it's not official - I think) and is also mapped to the 'tilde' key (above Tab). For more information on the Indian numbering system you can see http://en.wikipedia.org/wiki/South_Asian_numbering_system but to be frank we never heard of any number above 10 power 7... surprised to see that other terms are infact captured here! The notation needed for India currency was also news to me... very interesting a learning experience. I can't believe how provincial I feel. Anyway, I looked up the balance sheet for the State Bank of India. http://money.rediff.com/companies/state-bank-of-india/14030001/balance-sheet... I got so wound up trying to reparse the numbers (from hundreds, thousands, lakhas and crores TO hundreds, thousands, millions, billions) that I immediately lost track of the importance of the information content... and then there was the (Rs crore) notation on the bank information which told me that the parsing process was going to be even more complicated... and that does not even factor in currency exchange rates to get to a point of relative reference (in my case back to dollars). Chandoo tells us that: Large amounts of Rupees are expressed in lakh rupees or crore rupees. A Lakh Rupee is one hundred thousand rupees and a crore rupee is ten million rupees. And a little more digging gives these additional two digit group names: arab (one billion rupees), kharab (one hundred billion), neel (ten trillion) and padma (one quadrillion). Is this two digit comma notation used only for India Rupee curency value or is it used also used in India for volume measures (number of shares, tonnes of rice or bales of tea, etc)? As to the formatting formula there seems to be no way to add another filter term to this formatting line "[>=10000000]"Rs. "##\,##\,##\,##0;[>=100000]"Rs. " ##\,##\,##0;"Rs. "##,##0" and if you just add more "##\," to the format and the number is less than 10000000 then you get a lot of commas at the left side of the number. As suggested, using the "Kannada (India)" choice at the operating program level (Windows Vista) will immediatly switch everything not formatted in something specific to the two digit comma offset notation. I could not get the VBA programming (suggested by Rick) to work. When I implement this it gets hung up on the "Set R" code line and the ".Number" code row turns a nasty red color. >When I assign the Currency format with the symbol as "Rs. (English) India" to a cell and then look at it under custom formatting I get "[$Rs.-4009] #,##0" what does the "-4009" mean? This number changes for different currency symbols... but I cannot figure out the logic. >What needs to happen to get the new India Rupee symbol available to Excel users worldwide? @bill.... I think the problem you had with my code is due to the comment processor Chandoo uses... look at ALL the quote marks in all the lines of code... they are NOT the quote marks you need to use in the VB code editor. If you delete each one and replace it with one typed in from your keyboard, my code should work then. @Bill.. very interesting points you make. You are right in guessing that Indians often use the hundred / lakh /crore notation for measuring other numeric things, although we do follow metric system. 1) I dont know what the -4009 means either. May be someone can tell us what is the mystery behind this. 2) The Rupee symbol has been submitted for unicode approval. Once approved, I assume various font makers (and Microsoft, Apple etc.) would include the unicode and corresponding symbol in their distributions. Only then you can get it in to Excel , word etc with ease. Until that time you have to use a font like http://blog.foradian.com/ as Ninad points out above. Rick, your suggestion worked. I retyped (in the VBA editor) all of the code that was not alphabetic giving particular attention to the quote marks and the minus character... and it worked. Very interesting VBA, this opens up all sorts of possibilities. Thank you. Quick note: I have noticed that there is even a small sweet spot for formulas (placed within the R range) that yield numbers between one hundred thousand (a lakah) and nine hundred ninty nine thousand nine hundred and ninety nine (one short of a crore). Why does this this VBA parsing work at all on a formula?
" \,", "")) & ".00"
where you would replace the .NE. with a less than sign followed by a greater than sign. Thank you for the perfect solutions for excel. I resolved my problem through this ..
Oh! thank God for this! I am going to try it right away! @rick - your revised code works perfectly. Thank you. By the way, I found that if you add "[$Rs. ] & " after the equal sign and before the "Trim" function in the NumberFormat line you get the current rupee sign before the correctly formatted numeric string. In experimenting with this I have found that the only issues are with negative numbers. The negative sign pops out to the left of the Rs symbol and a zero value does not format properly (with the Rs addition). I am thinking that by adding conditional statements (LT 0, = 0, and GT 0) are set up at the IF loop where the number is being evaluated than this might lead to handling these outlier cases. I have not yet had a chance to try it. as the last line of code (immediately above the End Sub statement). Can you make use of the information at this link? I have tried the regional option's and it does not group. Thanks a ton for Regional setting idea! For a year I haven't been able to figure that out and had waster lot of my time. Thanks for the tip! Great! Nice formatting tips. It helps. How can we chang the US doller into indian currency in balance sheet (Excle file). According to the tutorials, everything before the first ';' is for positive numbers, and before the second ';' is for negative numbers, but it looks like you're using both areas for positive numbers. Thanks for the custom formats for INR. Much appreciated. One issue I've run into with what you've proposed is that the formatting doesn't always work for negative numbers. When I do this I get the correct formatting for the positive number, but not the negative number. I think that this may be because (according to the tutorials) everything before the first ‘;’ is for positive numbers, and before the second ‘;’ is for negative numbers, but it looks like you’re using both areas for positive numbers. It saved lot of time for me. This is a simple and great solution to a problem that had been bothering me for long. Thank you very much, Hui. You really are a genius! My excel appear 10,00,000.00 like that, anyone please tell me how to change to 1,000,000.00. I was try with several method but not possible. Its the opposite of the instructions above labelled"
A permanent solution to Indian Number Formats:"
It was very very useful. Thanks lot for the solution. Above custom number formating works fine with positive numbers. However, if I want to display negative numbers in [Red] and I do not want to change windows level setting. How it is to be done. 2. Only Custome Number formats to be used. I thought of workaround by using conditional formatting. But, I want to save this Indian format in Cell Styles so that I can easily apply whenever I need it. excel ninja-hi this works well for positive numbers. ofr negative numbers it is not. Thanks Chandu This is a great help...!!!! but the option you told here fully valid and permanent. Thanks a lot, i am unaware of it, it helps my account department. Thanks a Ton Chandoo for the great tip ! The Regional setting idea never occurred to me. Have been trying to tinker with the Custom Format in Excel and wasting time ! ” @@\\,@@\\,@@\\,@@\\,@@\\,@@\\,@@0? ), ” \,”, “”)) & “.00? Is there a way tp sort this?
" @@\\,@@\\,@@\\,@@\\,@@\\,@@\\,@@0"), " \,", "")) & " "
P.S: I'm an excel noob and have picked up this code from a forum i came across. Above format style doesn't work with negative values. e.g. - When value is positive it shows 5,00,000 but when value goes to negative it shows -500,000. Is there any way to tweak that ?? Thank you for the great resource. How would you do it for Chinese yuan? I have try to seek this option, but the option you told here fully valid and permanent. I have done all the setting in system (using Win8 Machine) to make it Indian format but in excel it is still showing upto lacs correctly but in crores it is again not taking (sample ? 134,55,000). I used custom setting for each cell that worked. Is there any permanent Solution because every-time i have to format cell. Thanks a lot for your Instruction. I actually used this to change from lacs format to thousand as this is pretty much a standard. Unfortunately my laptop came with a setting which only allowed lacs format. Your tips defenitely helped. Thanks a ton. How do u change the $ or the Rs. Symbol to the new indian rupee symbol in the Format Cells columns in excel. Please help been trying for quite sometimes now. This will introduce the INR symbol and format the cell as per accounting view (rather than a currency view). That is, left aligned rupee symbol and right aligned numeric value. Oops, guess the font of this discussion page does not have the INR rupee symbol !! Hence, whosoever wishes to use the above suggested custom format, please replace "?" in the custom format with the rupee symbol. Thank You, Thank You, Thank You for the helpful post. Thanks a lot. I just tweaked a little with Indian currency symbol and with decimal(paise) values. i changed in region settings... but its not working in the excel sheet... can u help me to solve this,,???? We have made an easy method to convert amount into Indian currency in words. Can you please link to us as well? I tried the custom format but it doesn't show the the digits (Paise). Still no format to get negative numbers in Lakhs & Crores.........???? ?